John Deere front loaders are designed, manufactured, and tested to the same stringent standards as our tractors. 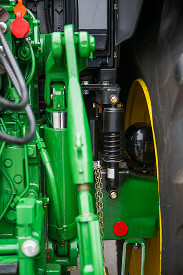 They fit the 6M Tractor perfectly, are compatible with the John Deere front hitch, work with reliable precision and durability, and allow superb all-around visibility for accurate positioning. A close-fitting hood guard is available to protect the front end from the possibility of damage during loader operation. The durable, oil-cooled PermaClutch™ 2 clutch disks in every 6M Tractor are engineered to manage the multiple directional changes that are typical of continuous front loader operations. Loads generated by operating a front loader are transferred to the middle of the rugged, full frame by cast-iron mounting frames for optimal weight distribution whether loaded or empty. 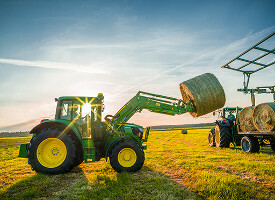 The mounting frame design and loader kinematics are optimized to bear the heaviest of loads with ease without obstructing access to tractor maintenance points or the front wheel steering angle. The front axle is constructed from three sturdy components, resulting in faster and easier turns, higher payload capability, and very high resistance to severe stresses. Pivot points benefit from an eccentric design while the bushings are made to manage heavy, directional loads and are easily replaceable. 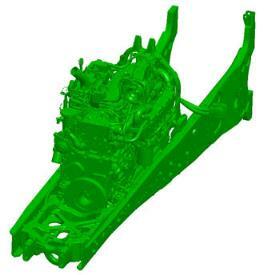 The high quality of John Deere front loaders is reflected in their long guarantees and infrequent service intervals. 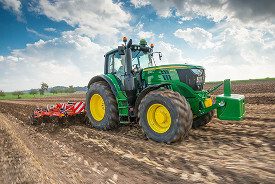 All 6M Series Tractors can be specified with AutoTrac™, John Deere’s integrated automatic guidance system. Complete with all the advantages that automatic guidance can offer, the integrated AutoTrac system is destined to raise your productivity by reducing input costs and boosting efficiency. AutoTrac masters both straight and curved tracks and works without any problems, even in low visibility situations. It reduces skips and overlaps, saving fertilizer, seed, and fuel. You could save up to 8 percent on your input costs. 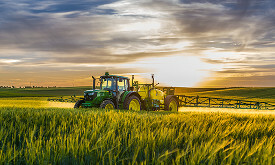 John Deere’s agricultural web portal, MyJohnDeere.com, unlocks the full potential of your operations. 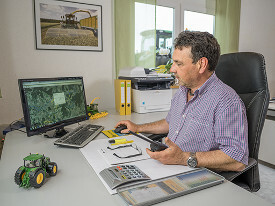 You can monitor and run your fleet of machines, stay up to date with weather forecasts for more efficient job planning, manage your land, allocate your equipment, track the work progress of your machines, and view what has been achieved over the day all from a central location and with all data in one place. 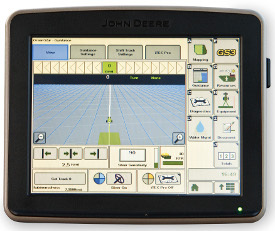 With John Deere Wireless Data Transfer (WDT), you can even send data over the air between MyJohnDeere and the GreenStar™ 3 (GS3) 2630 Display, eliminating the risk of data loss and saving time on data transfer. You can log on to MyJohnDeere from any computer or mobile device for an immediate overview of your on-going operations and to share data securely with your dealer, other business partners, trusted advisors, or customers. 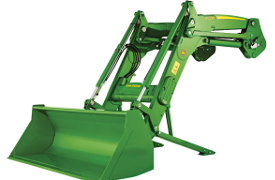 The John Deere full-frame design provides a rigid platform that absorbs and resists loads and shocks transmitted via the wheels, heavy implements, or front loader. To minimize the fatigue and stress caused by unpleasant vibrations, 6M Tractors can be specified with optional mechanical cab suspension. The design of the front axle delivers improved on-road handling characteristics, and its redesigned geometry reduces the amount of steering effort required. 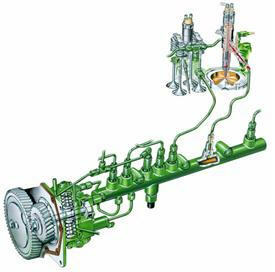 There is also the option of the Triple-Link Suspension (TLS™) system. The cab of the 6M is an extremely pleasant and efficient place to work. This system delivers optimum traction and in-field performance by putting up to 7 percent more power to the ground than a rigid axle. It automatically adjusts in response to changing load and draft conditions. TLS makes the going easier and more productive. 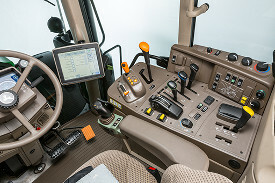 Keeping the operator relaxed and protected from irritating vibrations is achieved with John Deere's maintenance-free mechanical cab suspension. 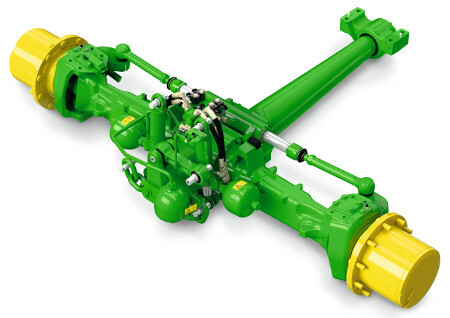 All John Deere engines are designed and engineered specifically for agricultural applications. 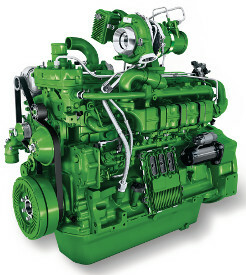 The 6M Series Tractors are powered by John Deere’s renowned 6.8L (415 cu in.) and 4.5L (274.6 cu in.) PowerTech™ engines, which have been revised to generate all the power you could need while consuming less fuel and meeting the demanding Stage IV emissions standards. The proven diesel particulate filter (DPF) allows the engine to respond quickly to changing loads. The engines are equipped with a selective catalytic reduction (SCR) system using diesel exhaust fluid (DEF) that has been developed by John Deere especially for these engines. Elimination of engine block stress, because the engine is no longer a structural part of the tractor. Reduction of noise and vibration transfer to other tractor components. 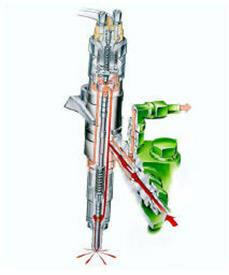 Magnetic valve provides fast and precisely metered fuel injection. Six-hole nozzles give optimum spray patterns and fine fuel atomization. Performance-matched fuel consumption delivers reduced fuel costs per hour. HPCR (400 bar-1350 bar) delivering exactly the same fuel pressure level at all of the injectors. High responsiveness under all load and speed conditions, which extends the engine's working range to lower speeds, delivering more power and productivity in the field at outstanding fuel saving engine speeds. 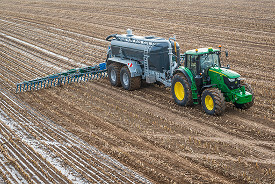 Performance-matched fuel consumption delivering reduced fuel costs per hectare. All 6M Series Tractor engines have a fast-response turbocharger, which is perfectly matched to the respective engine settings. The 4-cylinder engines, which have a high exhaust gas velocity in their shorter exhaust manifold system, achieve the best performance with a single-channel turbocharger. The 6-cylinder engines have divided exhaust manifolds with a dual-channel turbocharger. This careful matching benefits the operator with environmentally friendly, yet economical performance. There is a versatile 6M Tractor for everything you want to do. 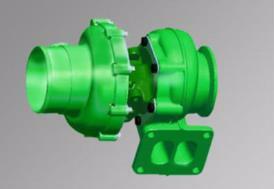 To underline that all-around capability, there is a choice of five available transmissions. One of the most exciting options is the CommandQuad™ Plus transmission. For enhanced convenience and productivity, the CommandQuad Plus transmission adds even more automatic capability. 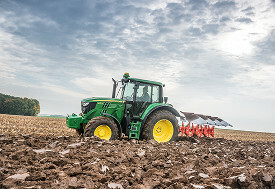 The smoothness of its AutoClutch function – there is no need to press the clutch when stopping – and the performance of the Powerfill brakes make 6M Tractors perfect for loader work and when hooking up implements. Choose between 20 forward/20 reverse (20F/20R) speeds or 24F/24R speeds. The intuitive single-control lever enables both manual and automatic speed selection and is complemented by the left-hand reverser. The EcoShift version with a transport speed of 40 km/h (25 mph) operates at engine speeds of only 1600 rpm.